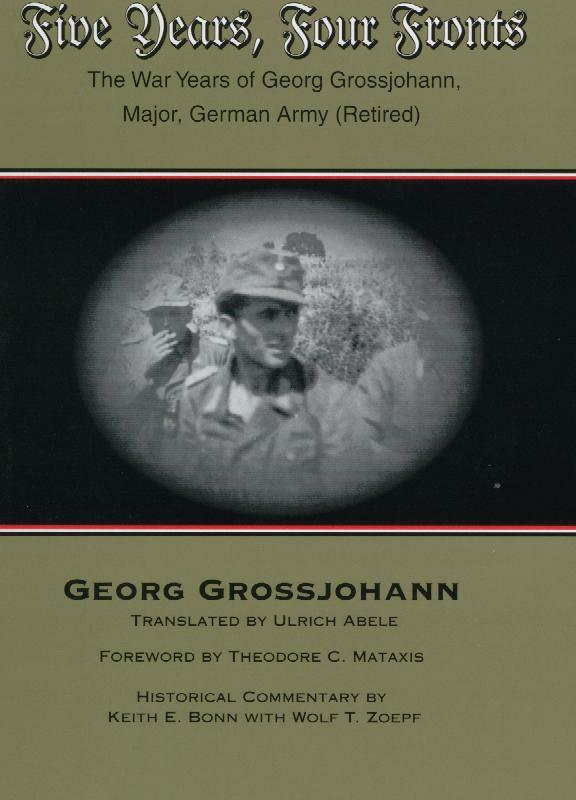 This book was written by a Wehrmacht veteran, Major Georg Grossjohann. 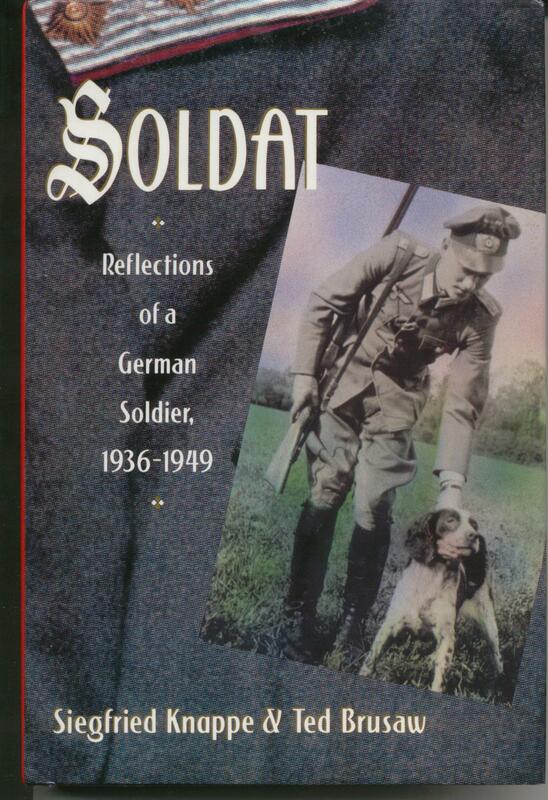 It is an honest and detailed account of his service in the German Army. When WWII started, Grossjohann wan an NCO. He worked his way up through the ranks to become a Major, before the war ended. You will get day-to-day accounts of life as a soldier. Major Grossjohann will take you to through the invasion of Poland, to the Maginot Line, to the Eastern Front, and to southern France. I have obtained a copy of this for myself and can not wait to read it! This book is new with 198 pages. A hardbound copy, it was released in 1999 and published by Aegis Consulting Group. Please email me for a shipping quote. 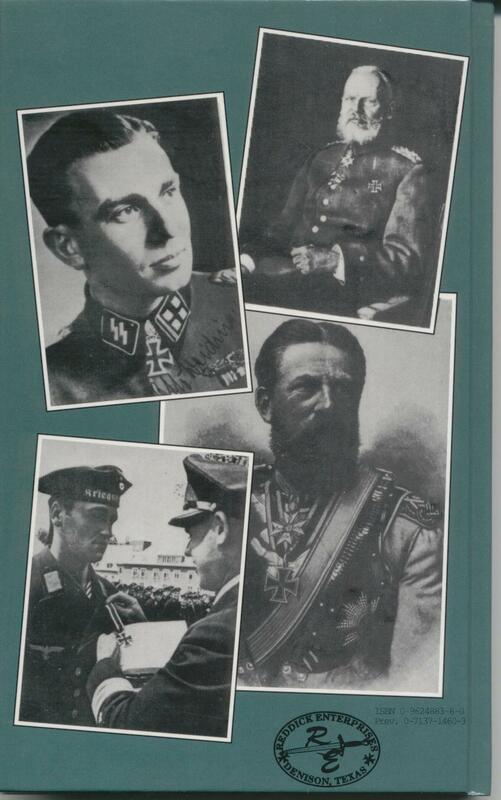 The very first true and definitive study of the Iron Cross. This is a first edition by Gordon Williamson. 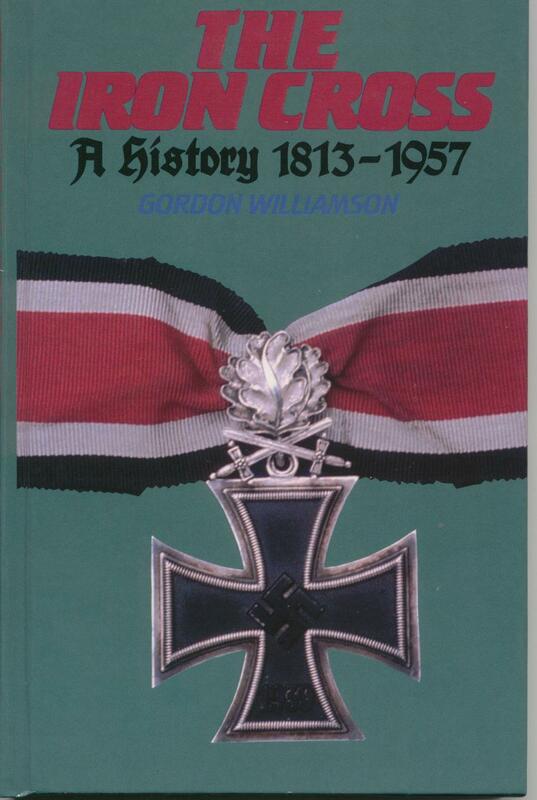 It provides a history of the Iron Cross from 1813 to 1957. Sections cover the second class issue, first class issue, the Grand Cross, and the Knights Cross. An appendix covers post-war reproductions, collecting and restoring, among other things. This is a great book for reference. 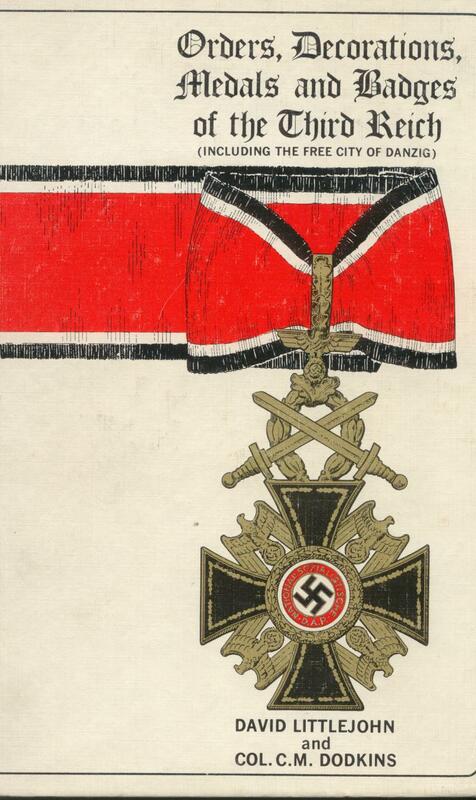 It contains many photographs of the awards being worn, as well as photos of the award presentation document for most of the Iron Cross awards. This book is used, but in great condition and has 176 pages. No dust jacket. It is published by Reddick Enterprises. Please email me for a shipping quote. This is a great book written by a WWII veteran, Siegfried Knappe. Knappe entered the German army before the outbreak of WWII. He advanced to the rank of major before the end of the war. This is his account of the war from the invasion of France to the defense of Berlin and finally Russian captivity as a prisoner of war. This book is easy reading and does not contain a lot of glorified boasting by the author. He tells it like it is. There are 384 pages of which 16 pages include photos. This book is used, but in very good condition. It is published by Orion Books. Please email me for a shipping quote. This is volume one of a two volume set. It was written by Robert E. Witter. "Chain Dogs" was a term used for the Feldgendarmerie. It was referring to the Ringskragen or gorget worn while on duty, that was suspended by a chain. 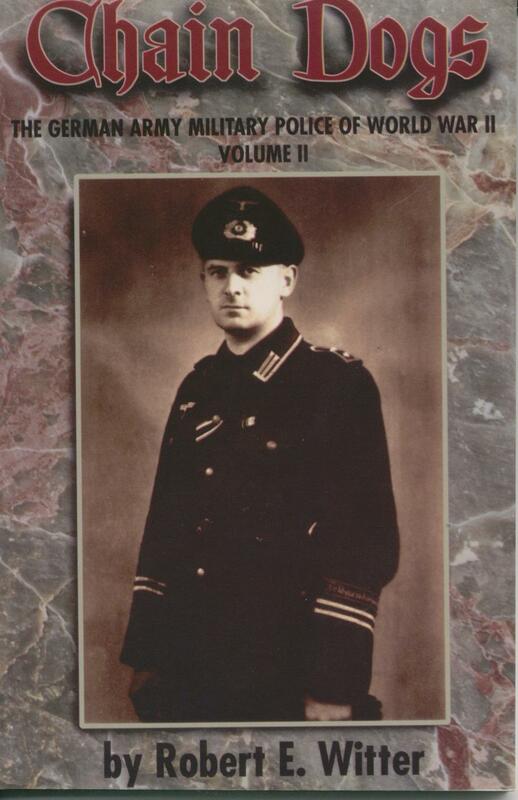 A must for the Third Reich Polizei collector.This volume covers organization, duties, authority, uniforms, and accessories of the Feldgendarmerie. This book is new and contains 124 pages, soft cover. Several photographs are included throughout. Published by Pictorial Histories Publishing Company, Inc. Please email me for a shipping quote. This is volume two of a two volume set. It was written by Robert E. Witter. "Chain Dogs" was a term used for the Feldgendarmerie. It was referring to the Ringskragen or gorget worn while on duty, that was suspended by a chain. A must for the Third Reich Polizei collector.This volume covers accounts of the Feldgendarmerie during pre-war, war time, the decline and post war during the Third Reich era. A Feldgendarmerie unit listing and many photographs are included in this volume. This book is new and contains 124 pages, soft cover. Published by Pictorial Histories Publishing Company, Inc. Please email me for a shipping quote. 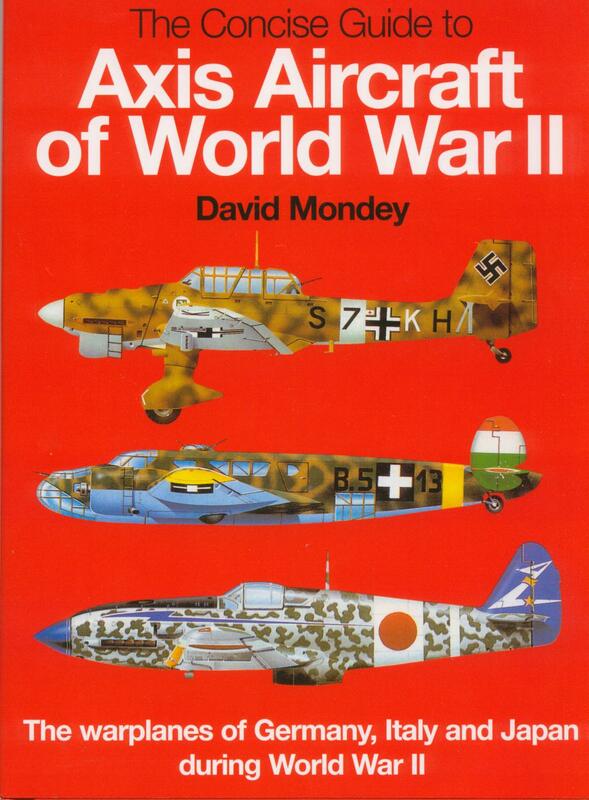 This book is titled "The Concise Guide to Axis Aircraft of World War II." It was written by David Mondey. It includes drawings, photographs, and specifications of German, Italian, and Japaneese aircraft used during WWII. This would be a good reference book for the aircraft enthusiast or scale modeler. It is a hardcover, new, and has 256 pages. It is published by Chancellor Press. Please email me at RelicChest@aol.com for a shipping quote. This is the history of the Seventh SS Mountain Division "Prinz Eugen." 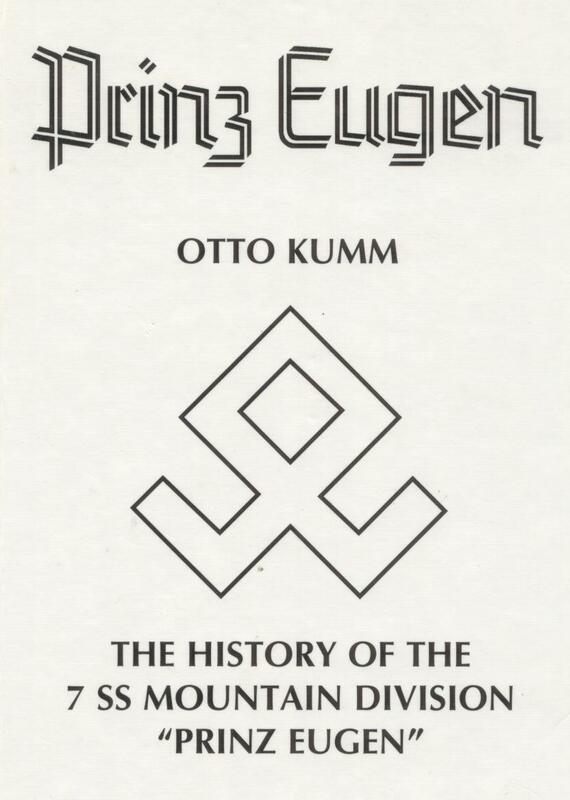 It is written by Otto Kumm a veteran of that unit. He claims neither to be a historian or an author. His main interest was in making sure the the unit was not forgotten to history. The Seventh SS Mountain Division was raised primarily in the Balkans from ethnic units and which fought through out the war in anti-partisan operations in there. This book is new, hardcover and contains 361 pages with an additional 23 of maps. There are also over 40 pages of photographs at the end of the book. Published by J. J. Fedorowicz. Please email me at RelicChest@aol.com for a shipping quote. This book was written by John Angolia.The first part of this book sheds light on the complexities of the uniforms & organization of the German Diplomatic & Government Officials. 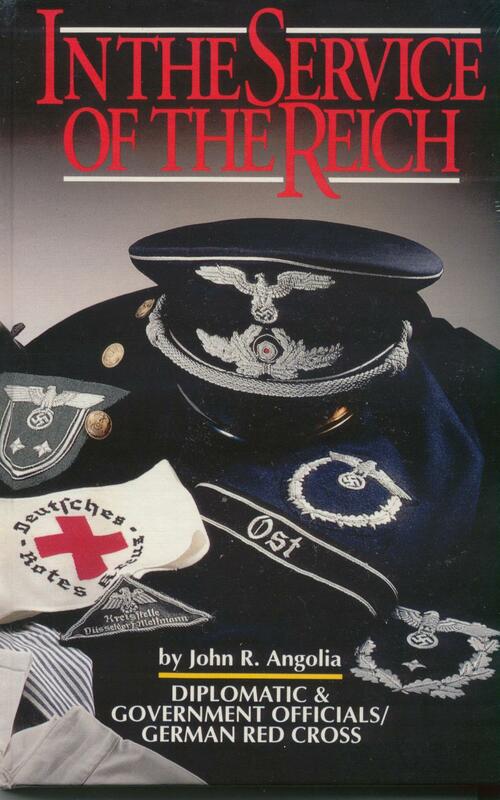 The second part details the uniforms, insignia, belt buckles, sidearms, awards,flags & pennants of the German Red Cross. This book is a hard cover in new condition and contains 368 pages. There are illustrations and photographs included. A good reference book. Please email me at RelicChest@aol.com for a shipping quote. 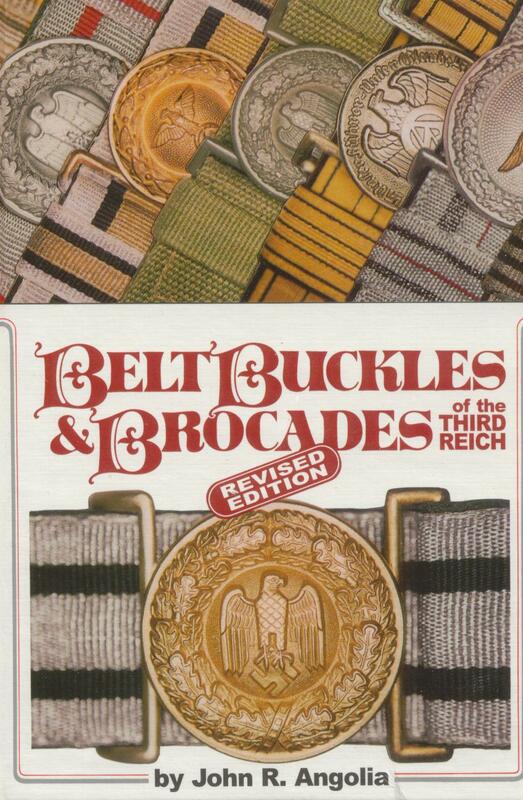 Belt Buckles & Brocades of the Third Reich by John Angolia. This is one of the most inclusive studies ever done on this subject. Topics include: manufacturing techniques, information about all known manufacturers, and an informative section about reproductions, just to mention a few. This is a hardcover book in new condition. It contains 656 pages and over 2,000 photographs. It is signed by the author. Published by R. James Bender Publishing. Please email me at RelicChest@aol.com for a shipping quote. Hitler Youth- The Hitlerjugend in War and Peace 1933-1945 wirtten by Brenda Lewis. 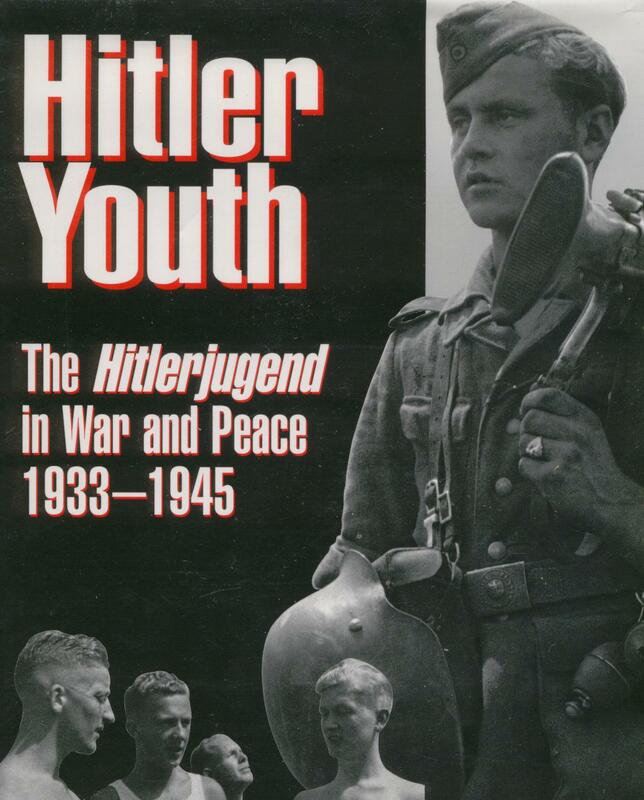 This book provides a detailed history of the Hitler Youth. It also includes in-depth descriptions of the Hitler Youth and the SS-Panzer Division Hitlerjugend in combat during WWII. This is a hardcover book in used but excellent condition. It contains 192 pages with photographs throughout. Published by MBI Publishing Company. Please email me at RelicChest@aol.com for a shipping quote. 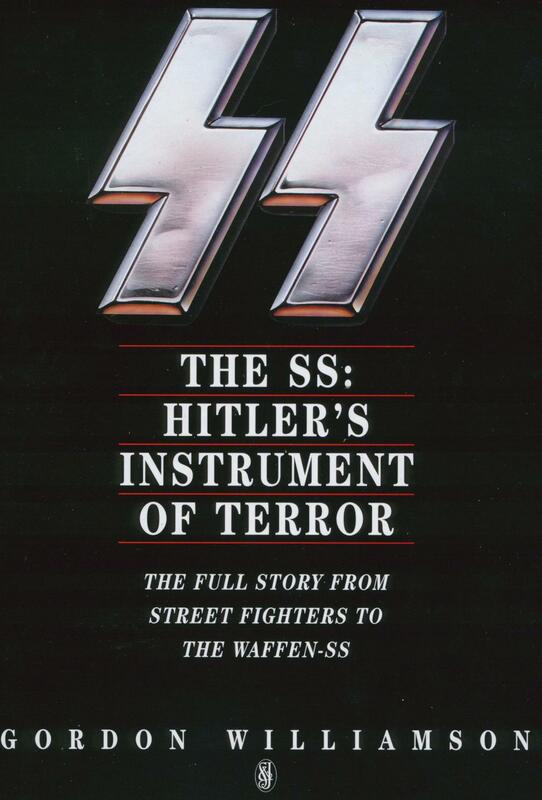 The SS: Hitlers Instrument of Terror The Full Story from Street Fighters to the Waffen-SS written by Gordon Williamson. This book covers the birth of the SS, the state troops, home service, Hitler's foreign legions, battles in the East and West, weapons and equipment, plus much more. It is packed with photos, illustrations, and maps. A good book to have if you are an enthusiast in the study of the SS. This is a large hardcover in new condition with 256 pages. Published by Amber Books Ltd. Publishers suggested list price $35.00. Please email me at RelicChest@aol.com for a shipping quote. 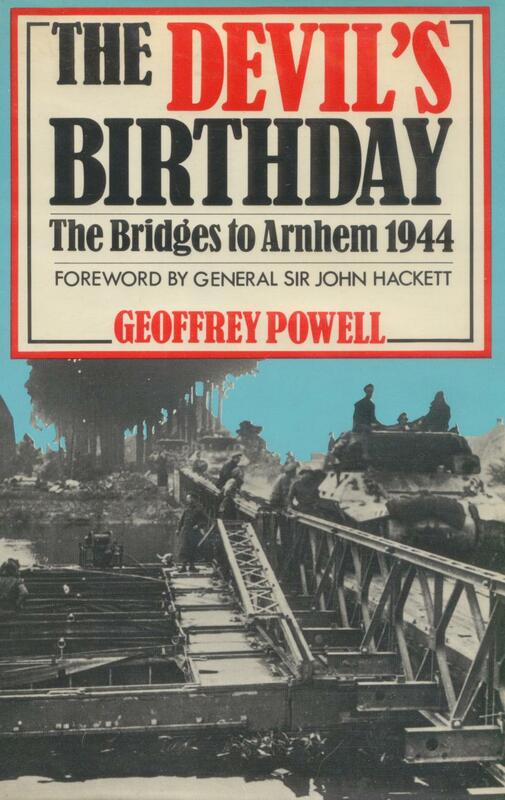 The Devils Birthday: The Bridges to Arnhem 1944 by Geoffrey Powell, who fought in Arnhem. This is the story of "Operation Market Garden" which started September 17, 1944. It is a story of commanders, soldiers, pilots and aircrew, and Dutch civilians in a battle to secure and hold a series of bridges that would lead the allies into Germany and bring a close to the war. It built up to a bloody and desperate battle for Arnhem and the last bridge needed for a backdoor into Germany. The German troops prevailed and the war went on for almost another year. This book is used but in very good condition with 276 pages. It includes several photographs and maps.Published in 1985 by Franklin Watts, Inc. Pages show a little foxing from age. Please email me at RelicChest@aol.com for a shipping quote. 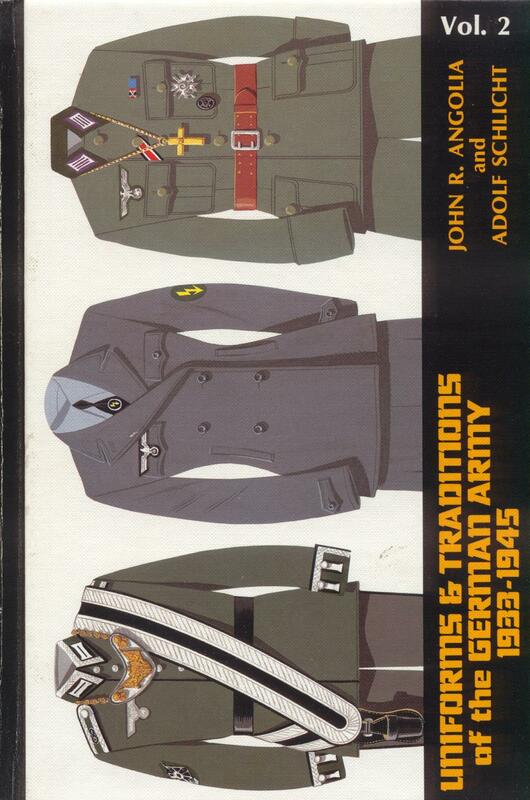 Uniforms and Traditions of the German Army 1933-1945 by John Angolia & Adolf Schlicht. This is the second volume of a three volume set. It is a must in the area of reference books. It is out of print and hard to come by. 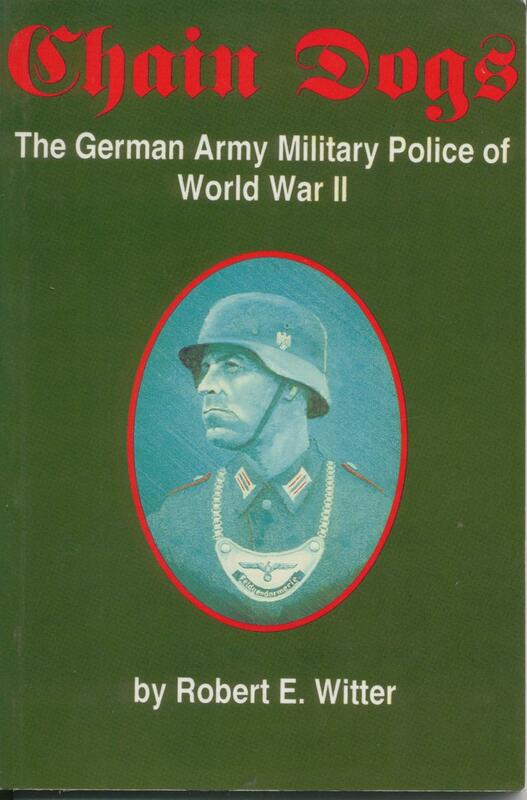 This volume covers specific insignia, badges for plain clothes, women auxiliaries, Organization Todt, Volkssturm, and much more. Several pictures and illustrations are included. This is a used book published in 1986 by R. James Bender Publishing.The book has minor shelf wear, but is in excellent shape. It is hard cover with 416 pages, no dust jacket, as issued. I have seen these books selling for over $400.00 each. Orders, Decorations, Medals and Badges of the Third Reich (including the Free City of Danzig) by David Littlejohn and Col. C. M. Dodkins. This is a nice little reference book on badges, medals, and decorations. It is contained in one volume and lists many of the major awards, plus some obscure ones. Included is Red Cross, Fire Brigade, Order of the German Eagle, Mothers Cross, Police, SS, Labor Service, youth badges, Sports Badges, cuff titles, shield badges, and many more. Several photographs and illustrations are included. This book was published in 1971 by R. James Bender Publishing and is the third printing. This book is used and in very good condition. It shows some shelf wear to its hardcover. The previous owners name label is also present. It is coming off, but I will leave that to you if you wish to remove it. It contains 231 pages and was issued without a dust jacket. 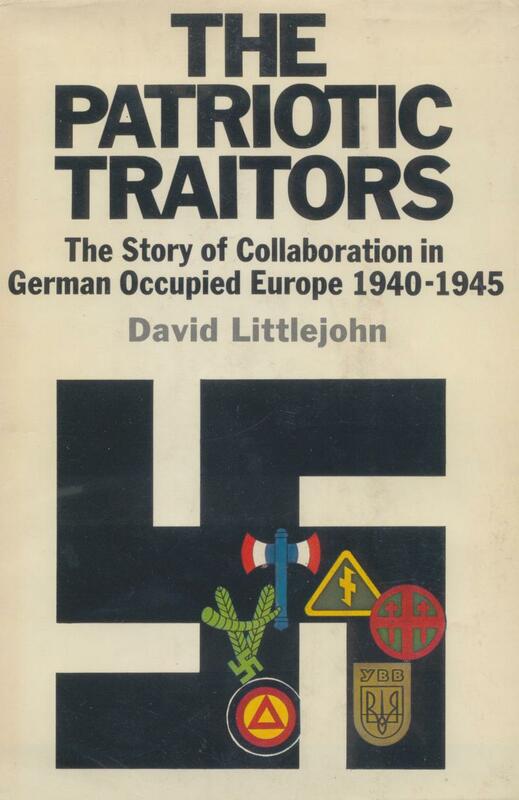 The Patriotic Traitors...The History of Collaboration in German Occupied Europe 1940-1945 by David Littlejohn. This is a carefully researched and well documented account of those who collaborated with and provided aid to the German occupying authorities throughout Europe during World War II. There is a chapter devoted to the actions of these groups in six of the occupied nations of Europe. These nations are Norway, Denmark, Holland, Belgium, France and the Soviet Union. The chapters are presented in the order in which they were invaded by the Germans. This is a hard cover first edition that was published in 1972 by Doubleday & Company. There are 391 pages of which seven contain photographs and two contain maps. The dust jacket has yellowed some over the years, but it is protected by a 1.5 mil book jacket cover. Overall, this is a tight and clean copy.